Now that the weather is finally warming around here, it’s time to think about changing up the way I cook for the summer. Like most people, I try to avoid the oven at all costs so we can keep the house somewhat cool. The slow cooker and the grill are my friends, as well as anything I can make without an appliance. That is why this recipe is perfect! Who needs Chipotle??? 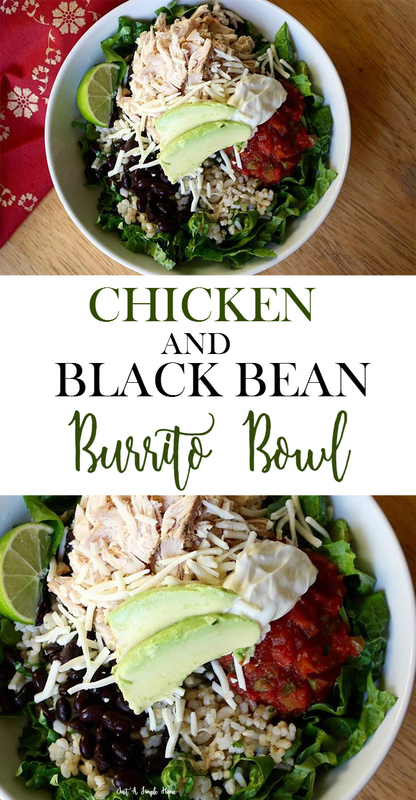 You can make your own Mexican-inspired chicken burrito bowl with cilantro-lime rice and all the fixins’. This recipe uses black beans, but you can substitute pinto beans if you prefer. With fresh salsa, a squeeze of lime, and creamy Greek yogurt on top of crisp romaine lettuce, you really don’t need any other dressing. Oh no, lol! My husband will eat it minus the beans. This looks so good! I love just about any mexican food! Looks delicious! I love the idea of subbing the sour cream for yogurt. This looks so good! I’m going to have to add this to my recipes. I love burrito bowls! Mmm. Looks very tasty! I like that you included yogurt as the dressing to keep it light weight. This looks amazing!!! I love making any kind of bowls for my lunch but these would be great for everyone in the family! This looks absolutely amazing! Burritos are one of my favourite cheat snacks so a healthier option sounds perfect! I’ve never actually heard of burrito bowls before now! But my goodness, do they look good! I am going to need to try this out!